Many people must have watched Amazing Race. It is a fun challenge-filled travel competition from different parts of the world. Many local versions of some countries have been documented also to help explore tourist spots and be flocked by travelers for community gains. There are many different types of ports to complete a destination. There are airports for airplane goers, seaports for overseas travelers, overland terminals for bus or van travelers. One challenge that I always want to do whenever traveling by plane is to get in the predeparture area in less than 10 minutes. Yes, less than 10 minutes. Many might not believe but it is possible. Even you travel through one of the busiest airports in the Philippines, the Ninoy Aquino International Airport Terminal 3. I often start my time after I get off the taxi. I often travel alone and it is easier to achieve the goal. Most often, it is observed that the airport entrance for departing guests has very long queues specifically when you take a look on a specific airline destination entrance. However, the airport's entrance is not just one, in fact, there are more than 4 entrances. 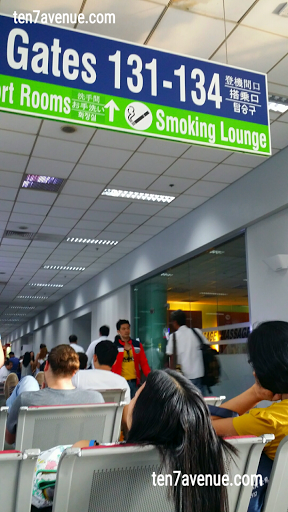 Do not be stuck queuing at a specific airline entrance wherein you can opt other entrances. You can always do it whether international or domestic destinations. It differs now in the check in process. One can do it knowing that you have more than an hour to do the check in process. Try it less than an hour and your sweat will flow like a river, armpits crying and heart pumping so fast. Tried it also. LOL I loved the adrenaline rush and I don't care if I am the last person to enter the aircraft and the eyes of many people on me. I tell you that is fun to experience for an adventurous person. Especially when your name is called for several times, "calling the last passenger for blah blah blah, Mr. blah blah blah to board the aircraft now. This is the final call for boarding. Thank you!" However, for an international flight from the Philippines to another country is a different story. Oh yes, very different. You must have that luxury of time to go on the process. Will share it again soon here at my avenue, www.ten7avenue.com.